Adachi Ward is located in the northeast of Tokyo, and is the fourth most populous of Tokyo's 23 wards, with about 670,000 residents. Unlike most other areas of Japan, its population continues to grow. More and more people are moving into the area as universities and new transportation services (including the Tsukuba Express and the Nippori-Toneri Liner) are developed, and new apartments built on former factory sites. Note on Adachi "City": Adachi is one of the Tokyo Metropolitan Government's (TMG) 23 special wards, legally designated as "special local public entities." These wards are in principle subject to the same regulations applicable to cities, and this may be why they refer to themselves, confusingly, as cities, e.g. "Adachi City," although in Japanese the words "ward" or "special ward" are still used. The relations between TMG and the 39 municipalities under its jurisdiction other than these wards (26 cities, 5 towns and 8 villages) are the same as those between all Japan's prefectures and their municipalities, but these wards (including Adachi) share in the financial and administrative systems of the TMG. Only in certain administrative areas do they function independently. Thus, in this article we use the term "ward." This issue of our newsletter introduces the activities of Adachi Ward Office's Power of Communities Promotion Division. A shocking incident took place in Adachi Ward in the summer of 2010 when the skeletal remains of an elderly man who had been dead for about 30 years were found. He was supposed to have been alive according to the family register and would have been 111 years old. This incident raised the issue of missing elderly people across the country, and similar cases and situations were uncovered in other areas. Adachi Ward took this social issue seriously. It already has 436 neighborhood and community associations which cover its entire area. Most of these associations belong to 25 regional neighborhood associations or Union Community Associations. The ward has 17 Residents' Offices that serve as its branches, and these offices support the neighborhood and community associations. Although the coverage of Adachi's neighborhood and community associations is comprehensive compared with other areas, the ratio of residents who belong to these associations continues to drop from a previous level of 70 percent to 57 percent in recent years. The ratio of members actually participating in the community activities is even lower, because most people are too busy to join in. In addition, the number of single-person households is increasing, leading to even weaker lines of communication among local residents. The Power of Communities Promotion Division was established in fiscal 2011 to strengthen community ties and tackle the issue of declining local communities, reduced communication, and the need for renewing community ties. In fiscal 2012, a section in charge of building bonds among residents was established as part of this division and now works to promote activities in support of isolated people. The Great East Japan Earthquake that occurred on March 11, 2011 reminded people across Japan of the importance of community bonds. Support in times of need can come in the form of self-help, community cooperation and government assistance. Government assistance does not necessarily reach victims promptly during disasters, as was apparent during this great disaster. In future, it will be essential to promote self-help and community cooperation strategies on a regular basis. The Power of Communities Promotion Division and the section in charge of building community bonds are charged with strengthening community bonds and empowering community cooperation in order to create a living environment in which elderly and isolated people can feel secure. The Power of Communities Promotion Division works to make Adachi a comfortable place to live so that people will want to continue living there. Examples of its activities are: (1) promoting membership in neighborhood and community associations, (2) promoting a personal training project ("Adachi Kaientai (mutual support squad) Project"), and (3) Promoting a "Zero Isolation Project." To promote citizen participation in community and neighborhood associations, the Adachi government published and distributed leaflets calling on people to participate. It also conducted research on citizens' awareness and related organizations, and categorized ward residents into several types based on criteria that included "relationships with others," "awareness of community activities and volunteer opportunities," and "daily activities," and is now trying to create approaches tailored to each group. About 18 percent of Adachi residents were categorized as "proactive contributors," who engage in many interactions with their neighbors and communities, whereas the same percentage were categorized as "purpose-oriented," indicating people who have many inter-personal interactions but are not engaged in community activities per se; that is, their relationships are with like-minded people in theme-oriented circles, gatherings and hobbies. Such people can be influential human resources in the community, and the ward government encourages the people who participate in such activities at 13 community learning centers and salons in Adachi to give back their learning to the community. People categorized as "potential contributors" (about 13 percent) generally live alone and do not have so many interactions with neighbors but do have some interests and take part in volunteer activities, and the ward created opportunities for such people to get involved in the community, such as events and lectures. To ensure citizen participation in neighborhood and community associations, the ward started a unique initiative in addition to generally encouraging newcomers to join the associations by giving them leaflets when they submit their moving-in notification to the ward office. In March 2013, Adachi struck a deal with real-estate businesses and the Real Estate Transaction Association: many potential citizens of Adachi visit real-estate agencies, and the ward asked realtors to encourage them to participate in community and neighborhood associations. Thus, Adachi has built up several strategies to promote citizens' participation in the community network that already exists, and which both fosters and exercises the power of the community. Another initiative is the "Adachi Kaientai Project" designed to foster new agents who can solve community issues. Many people want to do something for the community but don't know where to start. In this project, the ward collaborates with nonprofit and volunteer organizations to hold a one-year course to help such people understand local issues and use this knowledge in their communities. Currently, 220 Adachi residents are taking the course; 48 of them are people in their 50s and 60s. The primary targets of the ward's "Zero Isolation" project are elderly citizens. One of its main features is an ordinance enacted in December 2012 which is designed to protect such residents from isolation by allowing the ward to provide personal information about elderly people to neighborhood and community associations, and allowing the community network to undertake support activities. Information is provided about people aged 70 years and older who are living alone, and households consisting only of those aged 75 years and older, and about the approximately 35,000 households that do not use long-term health care insurance services. The information includes the address, name and age of such residents. Under the ordinance, isolation is defined as a situation in which the person in question talks with someone outside their own household less than once a week, or when the person has nobody to turn to for help with daily-life concerns. In collaboration with case workers, representatives of neighborhood and community associations visit the homes of the elderly to find out whether they are isolated or not. If the survey identifies an elderly person as being isolated and he or she does not refuse support from the ward, he or she will receive regular visits from the Kizuna (the ties that bind) Relief Cooperative, which consists of groups and individuals who have registered themselves at local support centers commissioned by the ward. In the case of households that refuse the survey, the ward regularly sends letters to inform them of local events and activities, as a way of showing them that it still cares about them. Currently, about 500 local volunteers keep an eye on the elderly. At present, the people who register with the Kizuna Relief Cooperative Persons are mainly such volunteers. When Kizuna volunteers drop by and talk to the elderly, for example on their way back from shopping or group exercises in the park, they provide advice on subjects the elderly person cares about, such as health or personal problems, and inform the ward and related organizations if necessary. Also, they inform the elderly about local events and encourage them to participate in social activities. Adachi Ward promotes these support activities in order to decrease the number of cases of social isolation, not just by watching and waiting, but by taking further steps to stay close to the elderly. Prior to the enactment of Adachi Ward's ordinance, Nakano Ward, another of Tokyo's 23 special wards, enacted an ordinance that allows the provision of personal information about the elderly to neighborhood and community associations when necessary. While Nakano's ordinance requires the consent of the elderly before providing their information, Adachi's allows provision of the information to neighborhood and community associations without the individual's consent. Adachi has thus placed priority on more active support rather than relying on each individual's will, as the latter may lead to isolation of the elderly and delays in discovering unattended deaths. Of course, Adachi makes a thorough effort to protect individual privacy and prevent information leaks by limiting people who can see the list of elderly residents' information. In January 2013, Adachi Ward launched a project to reduce the number of elderly isolation cases to zero, targeting senior citizens over 70 who do not receive long-term health care services in 36 model neighborhoods out of a total of 436 neighborhoods. Before this project started, the ward had launched the "Juku de Danran" (meaning, "group fun in the neighborhood") project in April 2012. 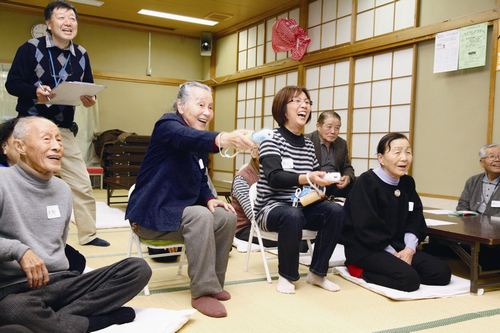 This project's activities take place at senior citizens' houses in Adachi called "Yuyu Houses". These facilities are normally open from 9 a.m. to 5 p.m., but they also provide opportunities about twice a month for spending time together and sharing dinner from 5 p.m. to 7 p.m. This Juku de Danran project offers activities such as simple games, karaoke or exercises followed by dinner in order, to provide more opportunities for communication. The ward tries hard to offer attractive activities so that elderly people can join in casually. Adachi Ward plans to expand the Isolation Zero Project with a view to supporting single-mother households, the challenged, and the stay-at-homes to prevent their isolation as well. In addition to those projects, Adachi Ward has promoted initiatives such as Beautiful Windows, which aims to make neighborhoods safe by making them beautiful, with reference to the "broken window theory," and another to decrease the number of suicides with the help of Mind and Life Supporters and Local Gatekeepers. As a result, the number of criminal law violations decreased from more than 10,000 in the past, the worst of Tokyo's 23 wards, to about 9,000 in 2012, down to the third worst, and then down to the fourth worst this year. The number of suicides is also decreasing, indicating an improved situation. Such complex initiatives require ward administrators to work together, transcending traditional administrative divisions and involving various organizations and groups outside government, because local residents do not care about such divisions. By taking this approach, the ward government is able to promote these initiatives by consolidating the necessary work even when it falls in an area in between related departments. Such a flexible work style should function as a good example for Japanese administrative bodies that suffer from decreased efficiency and effectiveness due to their vertically structured systems. We hope to continue monitoring Adachi Ward's initiatives to strengthen ties between residents to create a living environment where everyone can feel secure.